Tribes reminds me of another great little classic, Harvey Penick’s Little Red Book: Lessons and Teachings from a Lifetime in Golf. Their sizes are basically the same, both are full of useful stories and anecdotes; the writing is broken down into bite size pieces and it’s possible that you could find yourself referring back to them from time to time as you work on their subjects. In fact, golf and leadership have a lot more in common than one would first imagine. Both are often referred at as exercise though you’ll rarely break a sweat in either. Both LOOK simpler than they really are. And finally, the more you practice, the more you’ll improve. Nobody has become a decent golfer by sitting on the couch and according to Seth, you can’t be a leader without choosing to lead. One of the reasons I enjoyed this book is because I’m very interested in how technology and social media are impacting the traditional arts of leadership. The ways we communicate are changing and how that impacts our relationships and communication is changing too. Seth uses Wikipedia’s Jimmy Wales as an example. “Wales connected the tribe members to one another with ever-evolving technology that made it easier and easier to engage the outside world. Twitter, Facebook, BaseCamp and Ning are all mentioned briefly as tools to connect tribes members. I also enjoyed his analogy between magic and leadership and his short section on Belief and the power of stories. All in all, this is a good little book that while it might not make required reading lists in graduate level leadership courses, it would fit nicely on every student of leadership’s bookshelf and I enthusiastically recommend it. 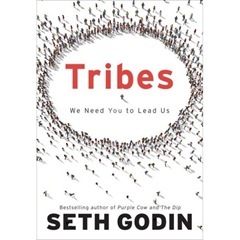 Tagged with Seth Godin, Weekly Leader Book of the Month. Excellent. Thanks for sharing it with us.